Sixers’ summer league preview: Which players could stand out in Las Vegas? 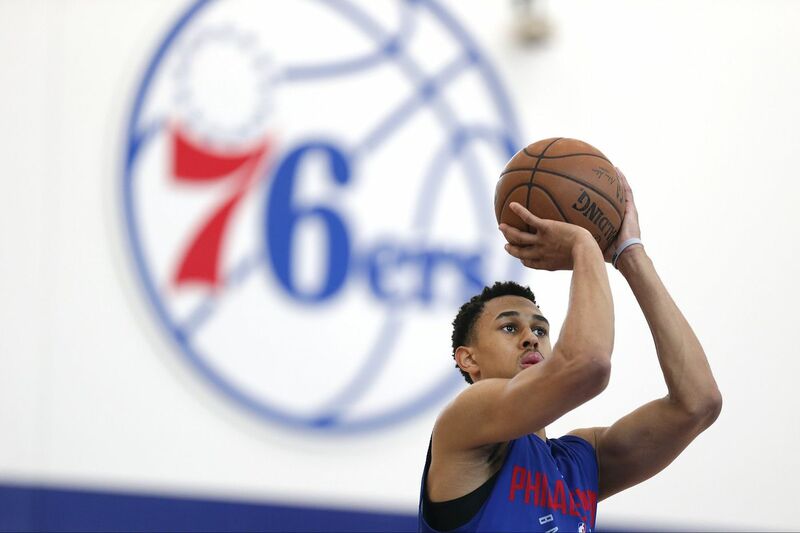 First-round pick Zhaire Smith takes a shot during the 76ers' summer league camp this week. The 76ers' summer league minicamp came to a close Wednesday with a final practice in Camden. Now the team heads to Las Vegas, where it will open the summer schedule against the Boston Celtics on Friday at 7:30 p.m. on ESPN. While some of the names on the team's summer roster will be familiar to fans, there are others that will not. Let's take a look at six Sixers you should pay attention to during the summer showcase games. These are the obvious ones. The Sixers' first-round draft picks, who both signed their rookie contracts this week, will be showing off their skills in Sin City. Throughout the week, Smith's athleticism has been a talking point, with teammates calling him a "freak of nature" and "one of the most athletics players" they've ever seen. What does that mean? Expect to see Smith go from zero to 60 in no time at all. His explosiveness and ability to play through contact while making tough plays look easy and his defensive prowess set him apart. Kevin Young, a Sixers assistant coach who will be the summer league team's head coach, has been impressed with Shamet's shooting through minicamp, so look out for some bombs from the kid out of Wichita State. "Landry is a shot maker," Young said Wednesday. "I like him. He's going to fit our style really well." Jonah Bolden will be back for summer league in Las Vegas. That's right, the Sixers' internationally stashed Australian power forward will be joining them in Las Vegas for a second consecutive season. It has not been decided whether Bolden will stay stateside with the Sixers for the 2018-19 season or be returning to the international scene to play with Maccabi Tel Aviv after summer play concludes. Either way, more time to see what Bolden can do and his level of improvement is good news. On Wednesday, Young noted that during last year's summer league games, Bolden showed off his ability to defend and stretch the floor. His joining the team for another outing gives an opportunity to see if all the hype is warranted. The 6-foot-8 forward, who went undrafted in 2017, closed out last season with the Delaware Blue Coats, the Sixers' G League affiliate. In minicamp he's been showing off with high-flying dunks during scrimmages and feeling confident about the opportunity to show his growth. "Just show how hard I've been working, last year I didn't have much of a chance," Oliver said. "I've got experience, I've got one year under my belt." Taken 45th overall by Boston in the 2016 draft after three years at Notre Dame, Jackson bounced around the G League before landing a two-way contract with the Sixers last season. He's had the most exposure to the Sixers' system, schemes, and personnel, leading Young to call him the veteran of the Sixers' summer league squad. At 6-1, Jackson is considered undersize in the modern NBA, but his physicality and strength have continued to pique the interest of teams. Coming off several G League assignments, McCullough is another player who has a chance to show his NBA mettle. Drafted 29th overall in 2015 by Brooklyn and injury-plagued in the early days of his career, he has hung around looking for his chance to break through. "The thing that has stood out is that he is an NBA talent," Young said. "He has the size and he certainly has the athleticism, he has the shooting ability."